Aalayam - Colors, Cuisines and Cultures Inspired! 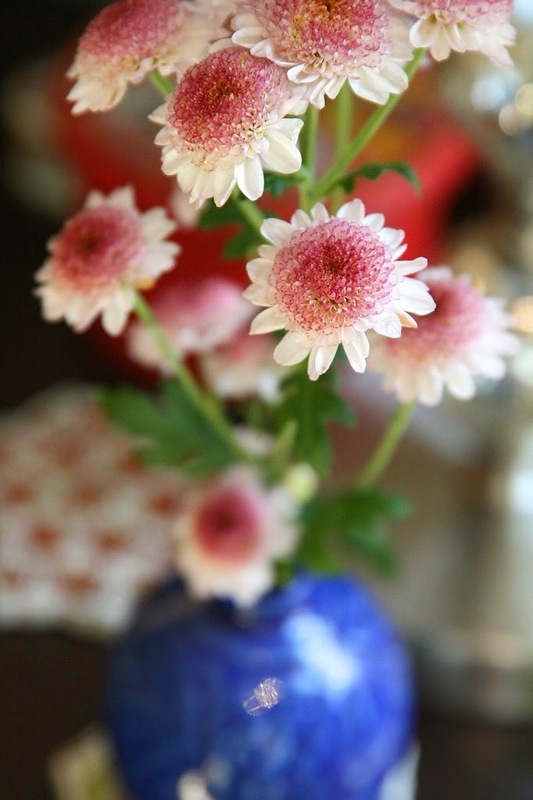 : Home tour - Boho-chic - a little vintage, a little modern and yet so endearing! 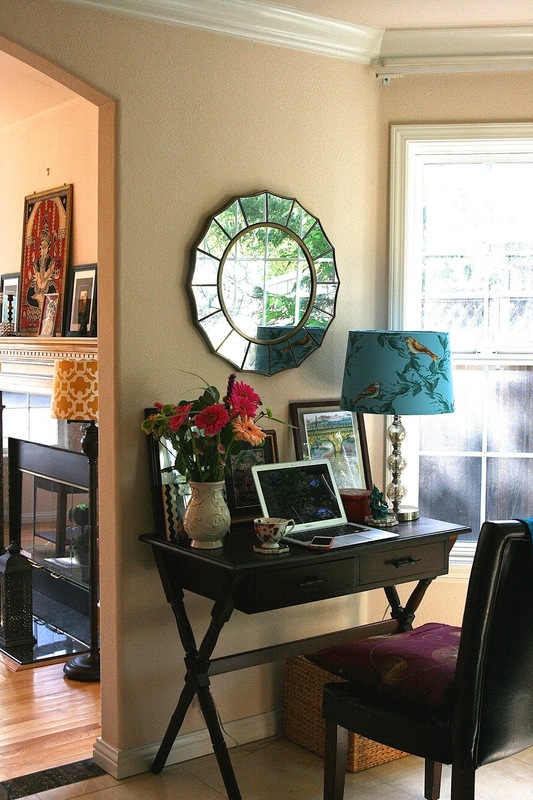 Home tour - Boho-chic - a little vintage, a little modern and yet so endearing! And I am back with a home tour /blogger showcase and in this post we will redefine hip and inspirational via images from Priya’s boho-chic home and her online magazine (Curated) and blog (Once upon a tea time). Priya lives in Nothern California with her husband and two boys and is one of the pioneer design/lifestyle bloggers in the Indian/ global arena and her work is without doubt an inspiration to many of us. Her boho-chic space on the www is my go to outlet for not just stunning visual imagery but also articulate conversations and enriching life lessons! 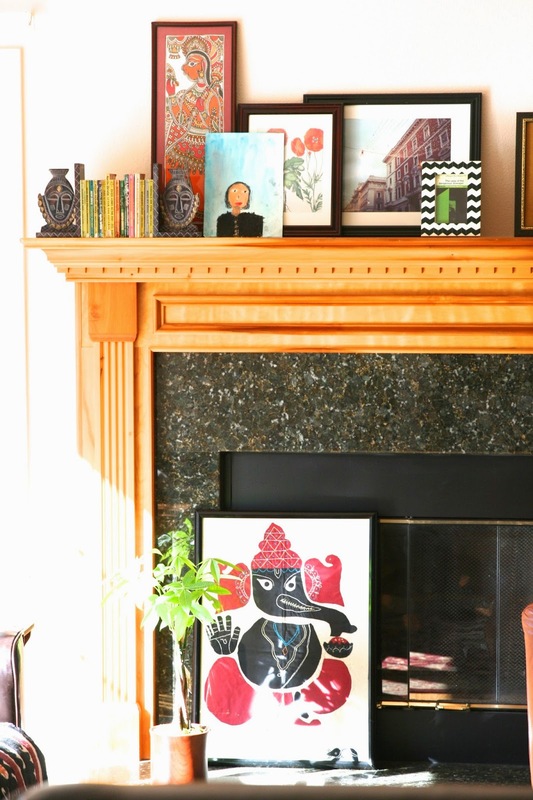 Recurrent images of steamy cups of chai, intricate vintage fabrics and her eclectic art wall give the aesthetic of her blog a legendary stamp and a timeless appeal. Recently, she launched her own publication – curated magazine and we at Aalayam love Curated for it’s classy, colorful and highbrow content that is a must -read for any discerning reader! Supriya had written about curated back in February when Priya had graciously invited Supriya and me to be a part of the February edition and here is what Surpiya said “Curated is a veritable visual treat! Its fresh, sets a serious design tone with its boho-chic influences, and blazes the trail for all the bloggers in the business of self publishing. Priya, with a keen eye for design detail and a refreshing repertoire of verdant imagery punctuates Curated with oomph, style and tons of inspiration” and I agree! 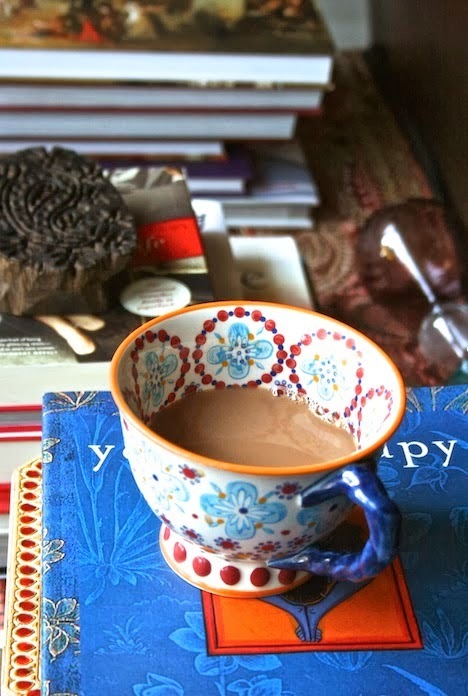 The rest of this post includes insightful excerpts and first-class images from Priya’s blog and home, so grab your cup of chai and sit back! On blogging: “I am sitting in my little blogging headquarters and thinking that I really need to spend more time here. It is as if when I am in other parts of house I have predetermined roles to play- spouse, householder, parent- but when I come in here and sit at my desk, I am suddenly free to be whoever (whomsoever?) I want to be. Free to dream. Sitting at my desk with its fraying vintage tapestry, I could be a journalist filing a story about the revolution with barely minutes to go until the deadline. A writer tap-tapping away at my keyboard, trying to write his magnum opus, amidst the lawn mower whine and Japanese pop music echoing outside the room. A dreamer day dreaming of traveling to beautiful faraway places. Indiana Jones back from a thrilling adventure in South America and typing out his adventure (though I don’t know if he ever did that). Blogging is something I see myself doing even when I am very, very old. To a lot of people, a design blog is just that: yet another design blog. But to me, it’s a way of sharing with you what is beautiful about life. Vintage. Personal. Grace. Chic. Creative. Handmade. Art. Tea. A way of life that is an embodiment of these words. I find it immensely reassuring that no matter what or when, I can always blog my way through it. On wearing multiple hats (she wrote this a couple of years ago when she was about to turn 40 and was in graduate school studying disease biology) but we can all relate to her words even today: "Like many women, I am used to looking at myself and focusing on the faults. Do you do that? But these days, I am discovering the positives too. I went back to graduate school. Yes, I drive back and forth from my university everyday and my commute is horrendous. (HORRENDOUS.) I have two kids and I drive in 2 school carpools. I fix lunches and dinners, write term papers, attend classes, take my kids to soccer, work in a research lab studying the bacteria in our bodies and blog whenever I have the opportunity. You bet, I am tired but I also feel amazing. And I am not the only one. Each one of us works hard at life and living and it would be wonderful if we could all see how amazing we truly are. Each. one. of. us." 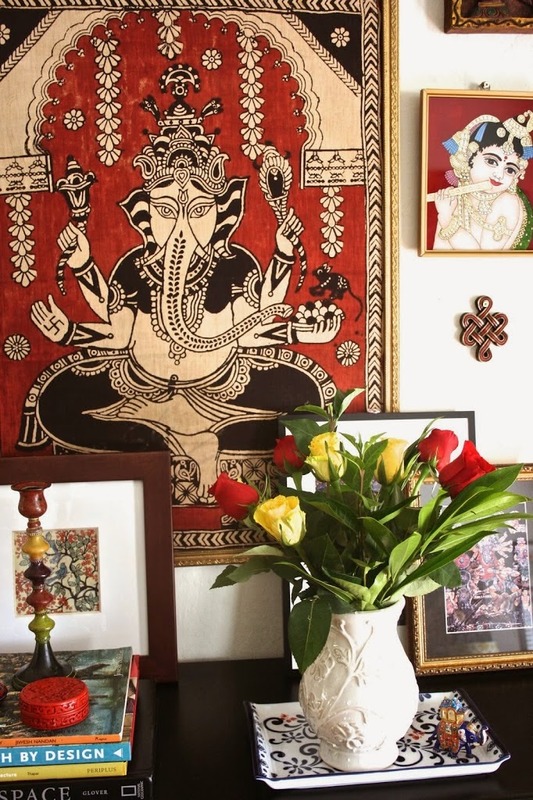 On her Ganesha wall art (If you frequent Priya’s blog, then you are familiar with her iconic framed Ganesha!) "Ganesha is said to be the remover of all obstacles in one’s path. 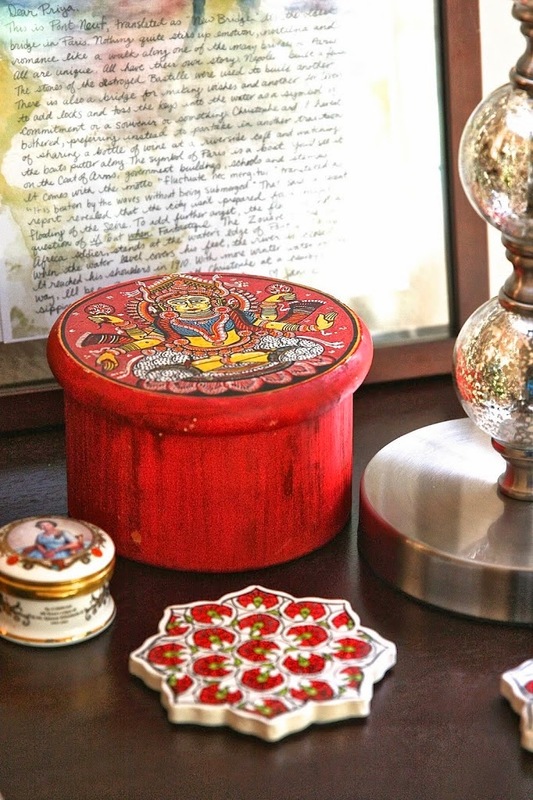 This cloth painting of Ganesh has been ushering the season in in our family for more than 30 years- it belonged to my mother and she gifted it to me when my husband and I bought our house." On vintage fabrics: "I am most inspired when I see vintage fabrics- they provide a visual punch that reaches into the deepest wells of my creativity and disperse any mental fog (sorry about all the mixed metaphors!). Ideally, every time I feel dull or uninspired, I would step out into an open air market full of vendors hawking colorful, handmade products. Figurines, pots and pans, paintings, baskets, puppets, fabrics and tapestries. 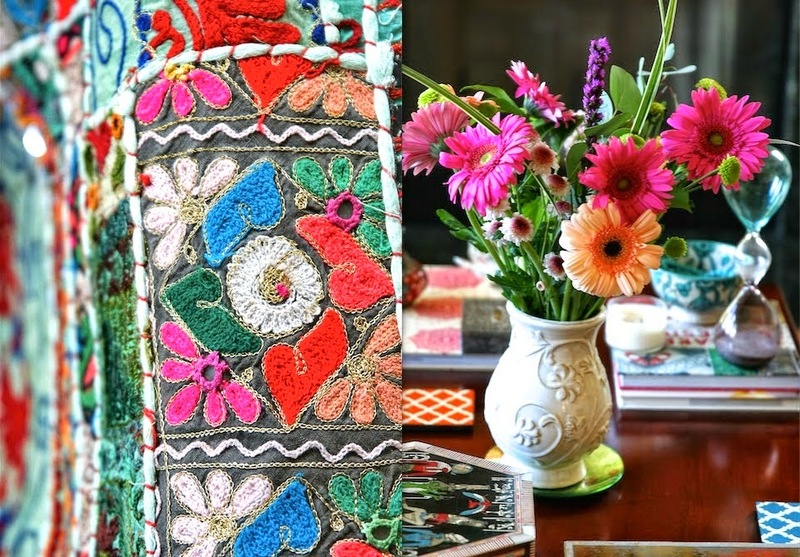 I love vintage fabric tapestries stitched together from embroidered cloth remnants, especially those from Northern India (especially the Ladakh region) and from Tibet. These tapestries and other vintage fabrics provide me with a jumpstart like no other- it’s something about the way different types of colors and fabrics are stitched together to make the whole tapestry. 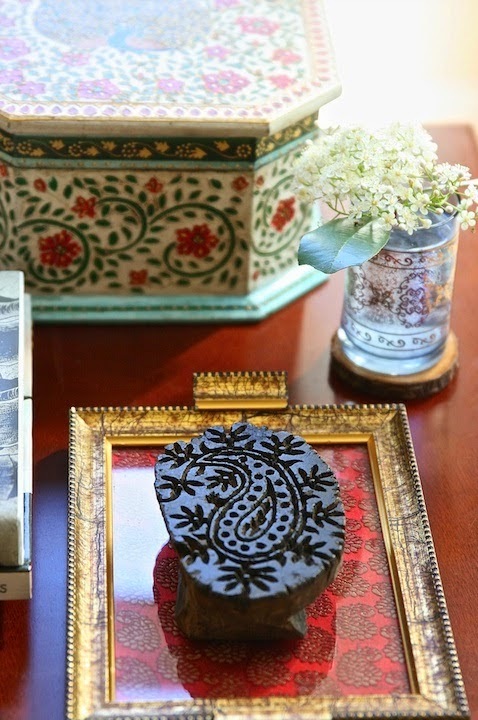 Each segment is beautiful and preserves its individuality while contributing to the gorgeousness of the entire piece. For some people, it’s art or a book or meditation or a walk but for me, it’s being surrounded by these fabrics." 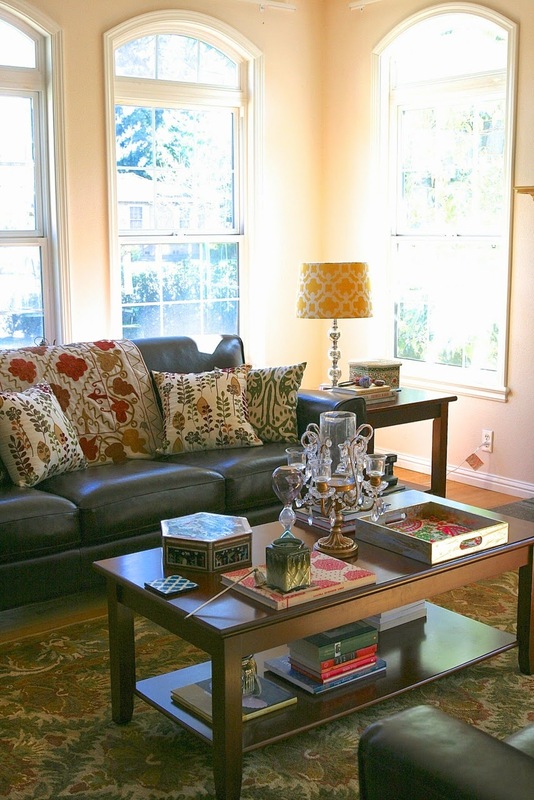 On her love of tea time :"When we were looking for homes, there was one feature that I always searched for. It wasn’t an extra bathroom or color or material of countertop or a fixture of any kind. I wanted the house to be one where teatime could be enjoyed (I would even say celebrated!). Yes, you could enjoy it anywhere but there are some houses that are just perfect for it. It’s not so much the tea or chai that is most important (though it is a vital component) but the time set aside for it- for preparing the tea, for getting the cups lined up, for choosing the accompaniments, both sweet and savory, for the laughter and conversation." "When I was a child, my family would travel to India in the summer holidays and we would visit relatives and stay with them for a few weeks. Each day, everyone would come together for teatime and it would all start- the men would set out the mugs in trays and the women would start brewing the tea. We didn’t use teapots but the chai was brewed, milk and sugar added and poured into the tea mugs. There were always biscuits (cookies). I remember the biscuits were stored in clean, shiny glass jars lined up in the kitchen cabinets and in pretty, tin canisters in the little storeroom- biscuits were essential to tea time. There were also savory/salty snacks for those without the almost ubiquitous sweet tooth. 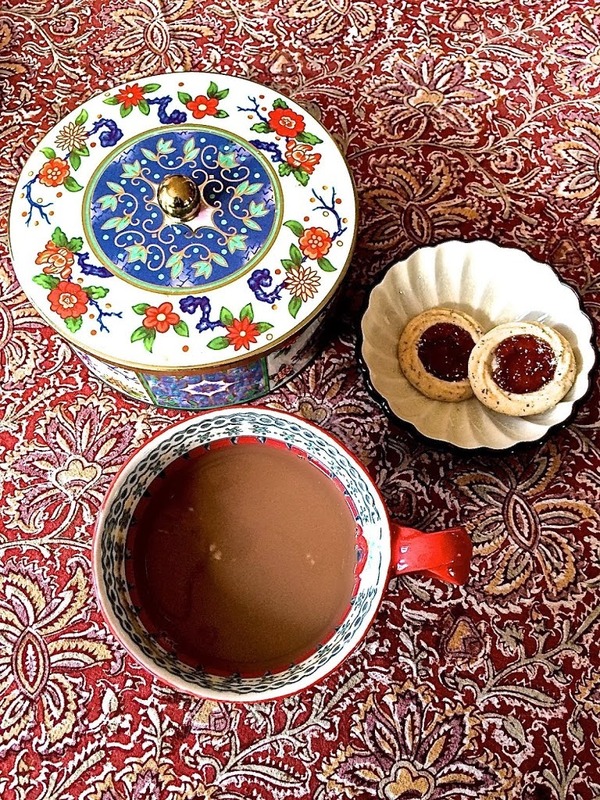 Once everything was ready and lined up on trays, there would be a moment of quiet as hands readily and gratefully accepted their cup or mug, savored the warmth of the chai and the rising aroma of cardamom and ginger. And then, it would resume- the conversations and the laughter. Time stood still, worries were forgotten and all that mattered was that it was teatime. Everything else could wait. There was feeling of permanence about those times (what an oxymoron!). 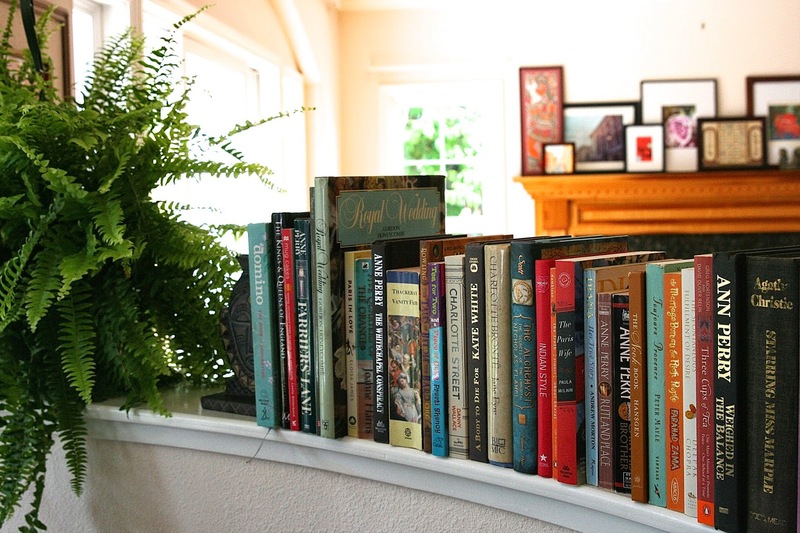 That’s what I wanted in our new home- I wanted it to have that feeling that any minute teacups would be lining up on trays, that fragrant steams of ginger and lavender hovered in the air and that you could hear the distant clink of glass jars being opened. We saw many houses during our search but one stole our heart- it had teatime written all over it." On Decorating nirvana : "One popular meaning of ‘nirvana’ is an ideal or idyllic place or state or mind or a state of peace. When I say decorating nirvana, I mean a state where you have achieved your ideal look. Whether you live in a rental property or your own, whether it’s an apartment or a house or everything in between, if you can create your ideal surroundings, you have achieved decorating nirvana! " "Let me explain. We moved into our current home 3 months ago, it’s our dream home and we love it. Though we still have to change some furniture, we are almost done setting it up. Which means I have hung art on the walls, there are frames leaning on the floor, a mix of contemporary photographs and traditional paintings; I have draped my beautiful vintage fabrics, set up piles of books and arranged my collection of objects from around the world. Add some flowers and a fern or two. This is how I create our home in every apartment, condo, townhouse or house we have ever lived in. I don’t see myself changing it. This is what interior decor means to me- creating that signature look which tells anyone entering the house our story and what we love (boho chic, all the way!). Once I have created this look, I am done. I will change the paintings around, rotate the objets d’art or switch this fabric for that or buy more but that’s it. After years of figuring out, we have arrived at a state of nirvana!" And finally her thoughts on what home means? "I am fascinated by what ‘home’ means to different people. As a project, I have started photographically documenting what it means to me personally and to those that I know. Is it a platform for expressing creativity, a large canvas where you, as the artist, execute your ever-evolving vision? In these times of blogs, Facebook and Pinterest, is it a place that is constantly striving for perfection? In that case, what does perfection mean? New and shiny or layered with the patina of life? " Thank you Priya for sharing some exclusive images of your gorgeous home and allowing me to use your work to bring your story to our readers! Make sure to catch more of her awe inspiring work on lifestyle inpsirations in her magazine! Beautiful...I love how she creates layers with frames and fabrics. It's wonderful to see her journey fom once upon a tea time to curated magazine. thanks for reading nayana. 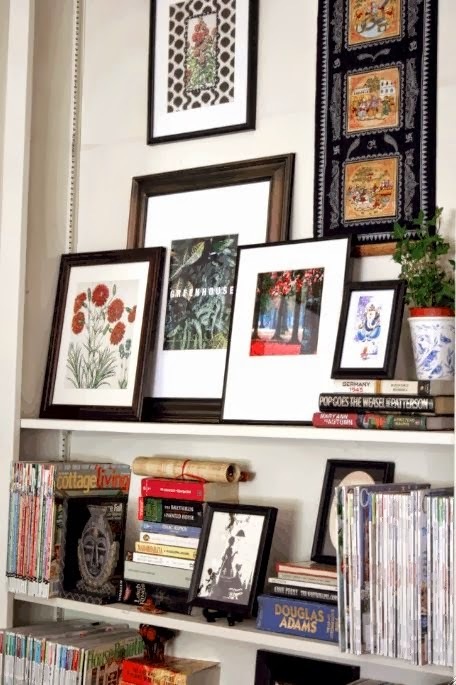 I love her style too- especially how she her unique ways of displaying art work! don't you just love what she is doing with curated? You express yourself really well Priya,you have a beautiful home ! Thanks Deepa and Supriya for sharing this. 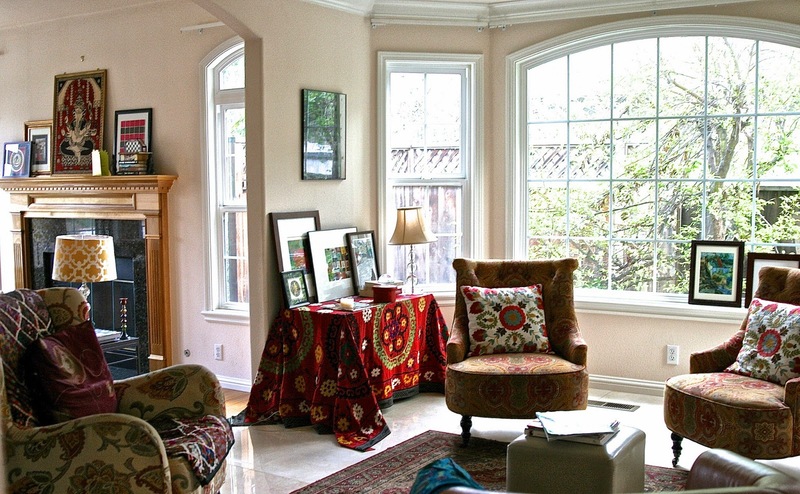 Thanks for stopping by karishma.. it is always a joy to share a beautiful home! Priya's home has been shared extensively on her blog and magazine but again a thing of beauty is a joy forever! Thank you for sharing valuable information. Nice post. I enjoyed reading this post. The whole blog is very nice found some good stuff and good information here Thanks..Also visit my page. property accounting We offer fixed fee affordable pricing for whatever your rental property structure maybe. Thanks jyoti. Sign up to become a part of the Aalayam family. We have many more inspirational posts coming up as we count down to our 100th. Haddock: Thanks for pointing out that we are in the directory. It is nice to be recognized but the blog is merely a platform for Supriya and me to share our passions- we are truly glad that it is so well received. Absolutely, i agree that priya's home is architecturally beautiful as well. Priya, Your new home is just beautiful and love the way you style. Aalayam, Thanks for sharing. Thank you reshma! I am glad you enjoyed this feature as much as I enjoyed bringing it to you. Priya - your new website looks AMAZING! Congratulations!!! Deepa - nice ode to Priya's abode. 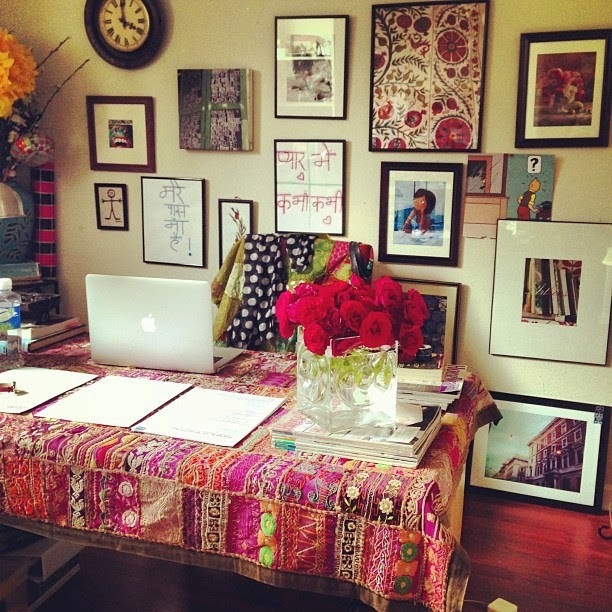 absolutely in love with her decor and style... so simple and elegant.. ;) thanks for sharing Surpiya.. Thanks shaz! glad that our regular readers enjoy our posts- your support and encouragement means much! I am sure priya will appreciate your kind words too. Thank you Deepa and Supriya for writing this post and to all of you for your kind comments! Love thecway she collects and displays art work.the architecture of the house gets full marks.displaying becomes easier that way.. So good to see Priya's home being featured here....love the way her new home and the magazine is taking shape!!Cheers! Lovely tour of Priya's home. Have seen glimpses of her home on OAATT, but loved seeing this bigger picture! 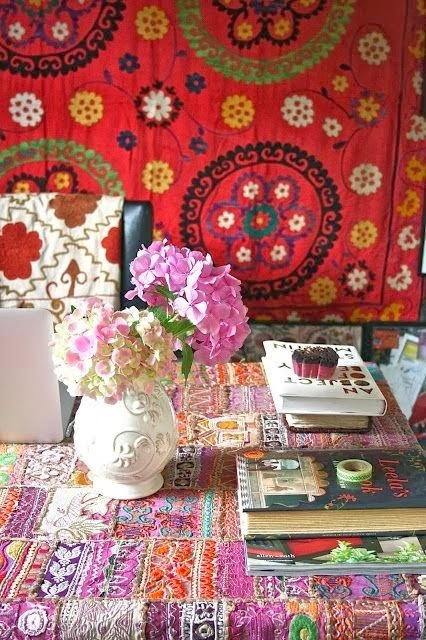 Truly bohemian, breaks several decorating "rules"
Very pretty ... I'm not like a lot of your followers but I really appreciate the colour and scope of your vision ... have a lovely festive season!